You have a big day coming up during the weekend and just the day before the big day, you wake up with a big zit on your forehead. So what do you do? Simple, follow the below given skin care tips and remedies on how get rid of pimple marks and put your best face forward. Pimples are basically small inflammations or sebaceous glands (oil glands) infected with bacteria. But a pimple scar, when treated the right way (like natural home remedies and trustworthy products) can be limited just to the top layer of the skin. Olive oil is said to be the most skin friendly oil because it contains a whole lot of vitamins (A, D, C, E, B), iron and antioxidants. The anti-inflammatory properties of olive oil also help remove acne scars. Take a little olive oil and gently massage on your face with this. Focus more on the pimple marks. Now take a clean towel and soak it in warm water. Put the warm wet cloth on your face and take steam. Now wipe away excess oil gently with the cloth. Do not rub though. Coconut is known to be a super food and its oil is very beneficial for the body. Coconut oil can help get rid of pimple and acne marks permanently as it contains anti-bacterial and anti-microbial properties, which helps fight against pimple causing bacteria. Mix a teaspoon of coconut oil with aloe vera gel in a bowl. Apply the mix on the face, especially the pimples and the marks areas gently. Leave on the gel for around 10-15 minutes till it dries out and thereafter massage gently with finger tips for another 5 minutes. Rinse with warm water and then pat dry and see the results immediately. Aloe vera is a well-known natural ingredient that works wonders for the skin. It not only helps in keeping excess oil out, but makes the outer layer of the skin soft, supple and smooth. Aloe vera is a succulent plant with medicinal properties that help reduce scars. Mix the three ingredients in a bowl and thereafter gently apply on the face, with a thick covering on pimples and marks. Leave it on for 15-20 minutes till it dries out. Also known as sodium bicarbonate, baking soda is a versatile ingredient, which not just enhances the taste of food but also helps in skin care. Known for balancing the pH levels in skin, baking soda helps in soaking extra oil from the skin. Take a teaspoon of baking soda and add few drops of lemon juice. Apply the mixture to the pimples and marks and leave it to dry for 10-15 minutes. Honey contains natural antibiotics that kills the acne causing bacteria. Apart from this, it also helps in clearing acne marks permanently. It is also antiseptic in nature and hence helps in the healing process of the skin as well. Apply a thin layer of honey and let it dry for some time. Thereafter, take a few drops of lemon and apply on the face. Massage skin with wet fingers for five minutes in circular motions. Sugar is an easily available ingredient that helps not just in exfoliating but also brightens the skin tone. It reduced dark spots and helps keep the skin clean. Take granulated sugar, milk powder and honey in a bowl. Keep the face pack on for 10-12 minutes and thereafter wash with cold water. Use this remedy twice a week for desired results. Egg whites help in lightening as well as removing pimple marks from the skin. Filled with protein and vitamins, egg whites are very helpful in regenerating new skin cells to erase zit marks and spots. Take out white from an eggs in a bowl and apply on pimples and marks. Lemon is the most-effective ingredients and single-handedly can do wonders for all kinds of skin related problems. Known for its lightening properties, lemon can reduce spots and marks considerably. Squeeze juice from one lemon and gently apply on the face. Massage gently with fingers for few minutes and thereafter let the juice be absorbed for 10-15 minutes. Pimples and their marks don’t go away easily hence it is very important to strictly follow the routine for skin care which can go a long way in making sure you get a clear, mark-free skin. Apart from these home remedies, there are many other ways by which one can get rid of pimple marks. Most importantly, do not commit a skin sin. A pimple that is meddled with—scratched, pinched or broken—will haunt you by leaving a pit or a scar on your skin, making you regret your indiscretion every time you look at it. But thanks to some great ingredients, there is still time to save your soul. One needs to drink lots of water to not just keep the body and skin hydrated, but also help flush out toxins from the body. Water will help circulation of blood regulated and hence oil formation will be less, leading to pimple free skin. Drinking water is also a natural way to boost skin health, thereby reducing acne marks as well. Ultraviolet rays from the sun stimulate pigment producing cells in the skin which can worsen the appearance of acne scars and spots. If it is imperative to be out directly in sun, always use a good sunscreen lotion or gel so that the harmful rays do not damage your skin. Always use a SPF30 or higher lotion so that it protects the skin. Apart from that one can also use a wide-brimmed hat and keep in the shade as much as possible. Chemicals are the main reason why skin eruptions and spots happen. Well, if one is in a profession where they cannot restrict the use of chemicals on skin, it is very important to take care otherwise. Always use natural cosmetics, and make sure to wipe them off skin before going to bed. Clogged pores cause pimples and marks and so it is important to cleans and wash off the makeup at the end of the day. Always use good quality make up so that harm to the skin is less. Eating right and healthy always has its plus points. Apart from keeping one’s health on the right track, good eating habits also enhances ones skin texture. Seasonal fruits and vegetables can do wonders for the skin, thereby reducing chances of breakouts and keeping spots and marks at bay. Avoid frozen and artificially-chemical laden food at all costs, as it increases the risks of pimples. According to experts, skin rejuvenates and replenishes on its own once we are asleep. So make sure you get adequate rest, at least eight hours at night so that body is not too tensed. And if convenience is rule number one in your beauty book, then a safe herbal bleach such as the new Fem Turmeric Herbal No Ammonia* Bleach is exactly what you need. With the power of turmeric, it lightens your skin tone, giving it a healthy glow. Turmeric is known to have antiseptic properties that reduce skin irritation while bleaching. It suits all skin types and it’s the first dermatologically tested bleach which is safe on the skin. To control pimple marks, control the pimple first! Follow a strict skincare regime and never sleep in with makeup or an unclean face. Dirt and grime will block your pores, leading to a build-up of bacteria and, eventually, a scary zit. Remember to exfoliate your skin regularly to let it breathe and unclog pores. 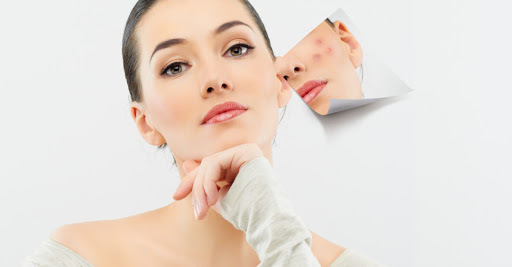 While pimples and acne can happen at any age, what is important to know that there are certain reasons attached to them and their recurrent appearance despite you trying hard to keep your skin clean and clear? So we'll talk about the causes of pimples in another article. Meanwhile let us know what you think about this article on how to get rid of pimple marks. Was it helpful or not?